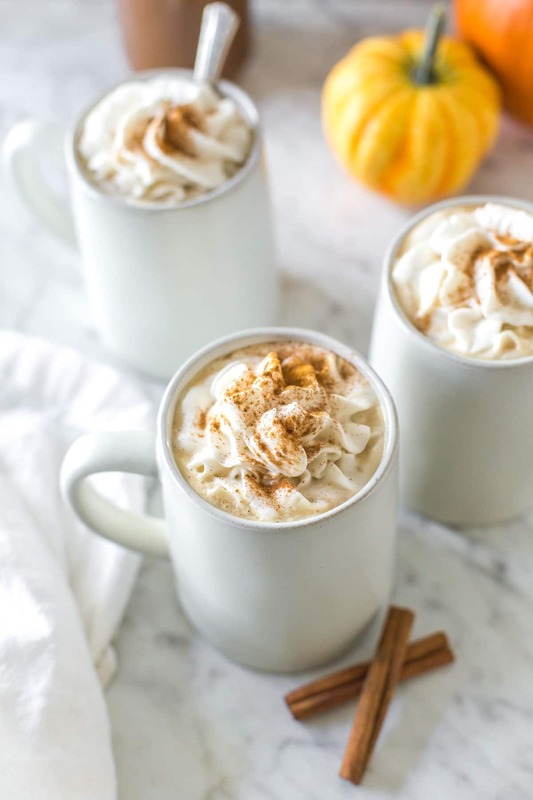 Everyone’s favorite fall drink is back with a dairy free twist. 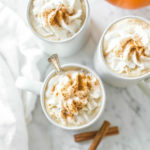 Make yourself a vegan pumpkin spice latte at home with this easy to make pumpkin spice sauce and your favorite coffee or espresso. Makes enough sauce for 12 lattes. 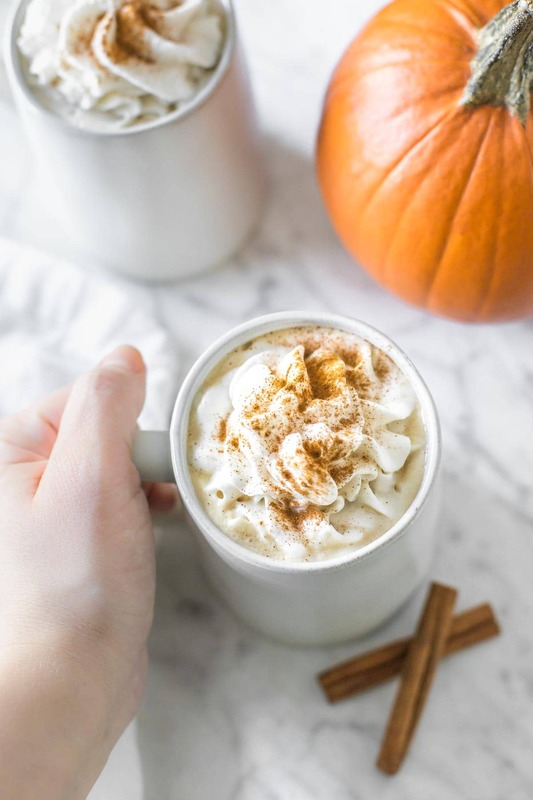 Since it’s already October, I think it’s safe to say that many of your are craving PSLs and many of the other cozy, comfort foods (and drinks) that fall has to offer. I know we’ve been all about the oatmeal for breakfast and hearty chili for dinner. And, let’s not forget about those slow cooker recipes. Sadly, the classic pumpkin spice drink has been off limits in our house for a while. 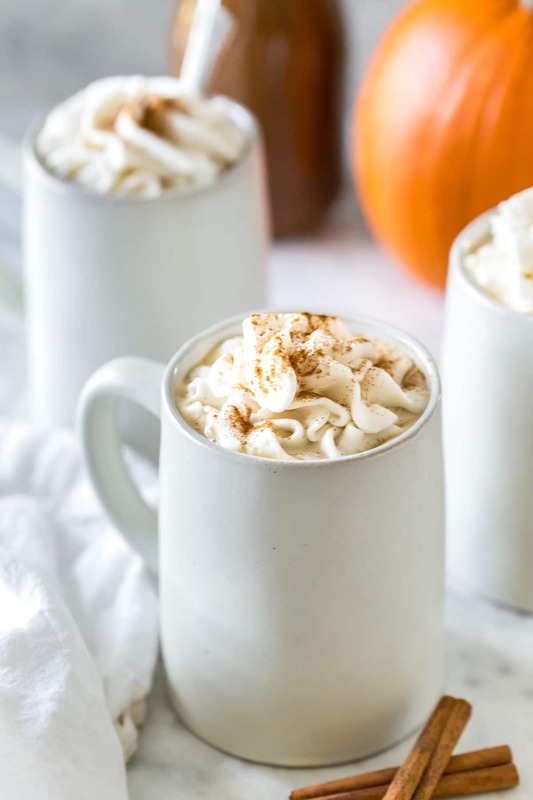 Even though we’ve been making due with other pumpkin spice recipes, I decided it was time to really learn how to perfect a vegan pumpkin spice latte once and for all. Are Starbuck’s pumpkin spice lattes vegan? The short answer is no. The sauce itself is made with milk, which means that even if you order it with a dairy free milk, it will still have milk in it. I think the reason this is so surprising is because we all just assume that the sauce is actually a syrup like the ones behind the counter, but it’s really more of a thick caramel-like sauce that contains milk. What’s in Starbuck’s pumpkin spice syrup? 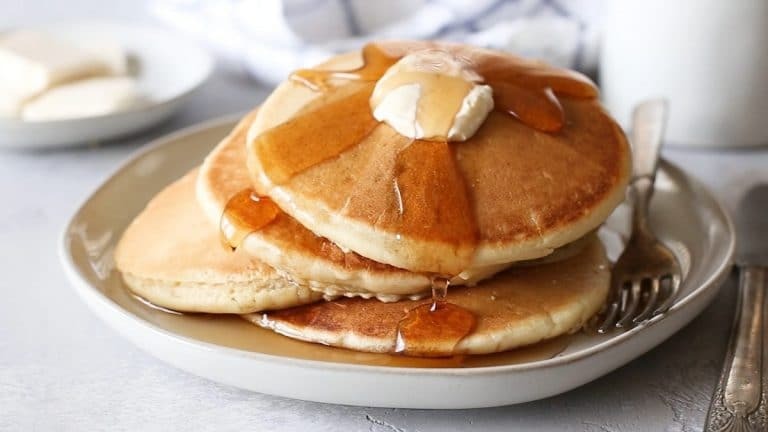 The syrup that Starbucks uses is actually a sauce that’s made of pumpkin puree, condensed milk, sugar, water, and spices. To make this recipe dairy free and vegan, I used a sweetened, condensed coconut milk that I found in the organic section of my grocery store. 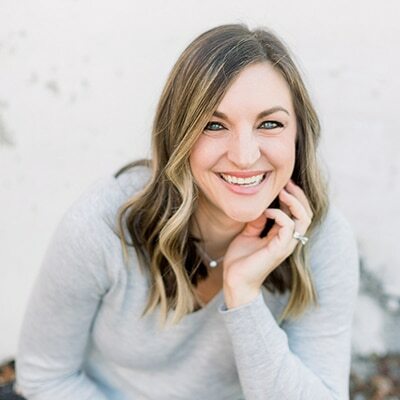 It’s made by a company called Nature’s Charm and they have a bunch of different vegan related products that are a game changer when it comes to following dairy-based recipes and making substitutions. If you can’t find sweetened condensed coconut milk, you can definitely make your own with any alternative milk prefer (this would especially be good if you can’t have coconut due to an allergy). First, make your sauce. Combine all of the sauce ingredients in a large saucepan over medium heat and whisk them until smooth. You’ll need to whisk regularly until the sugar melts. 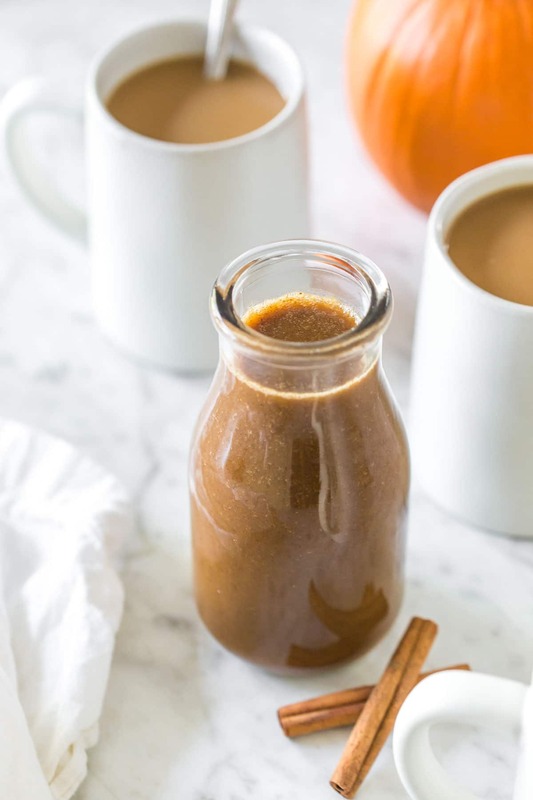 It takes a bit of time, but you don’t want to rush it and turn up your heat because you could risk turning your sauce into a candy or caramel that’s too thick to mix with coffee or espresso. Once your sauce is smooth and the sugar has melted, remove it from the heat and pour into a container. I usually use a mason jar for this kind of thing, but I also have a milk bottle style creamer jar with a rubber seal that I use, mostly because it’s cute. Second, make your coffee. Typically, lattes are made with frothed milk, a little foam and espresso. This obviously isn’t something everyone can do at home, so I recommend making espresso coffee in your K-cup brewer or a rich, dark roast coffee like Cameron’s Velvet Moon. If you can choose a strong brew setting, do it. Third, add your pumpkin spice sauce. You’ll want to add about 1/4 cup per mug. It might seem like a lot, but remember, this is a sauce, not a syrup. Last, add your warmed milk. Obviously, you’ll want to use a vegan-friendly milk like almond or coconut milk. We normally keep cashew milk on hand, so that’s what I used. You can warm it in a milk frother or on the stovetop. If you’re using a frother, use a spoon to hold the foam back until after you’ve poured your milk. Then, top with foam. If you want to get really fancy, check out this barista’s guide to frothing almond milk for latte art. 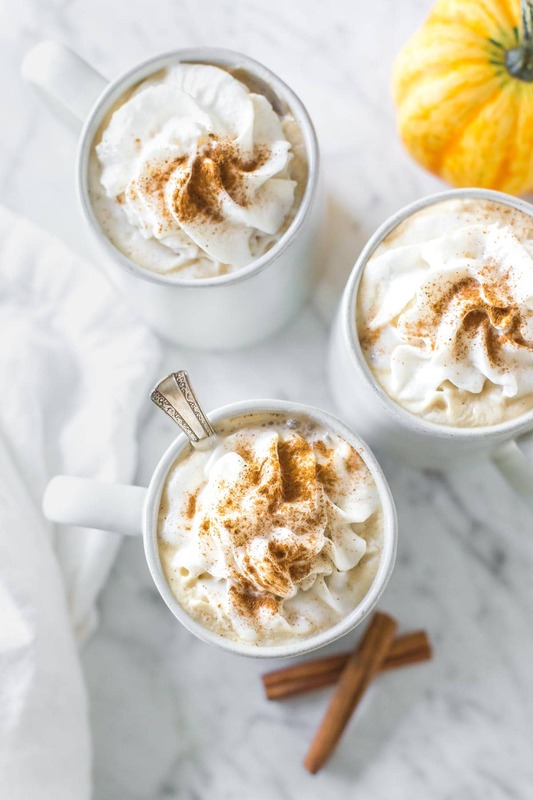 You can also top your drink off with dairy free whipped cream. My favorite is the coconut one by Reddi-Wip. 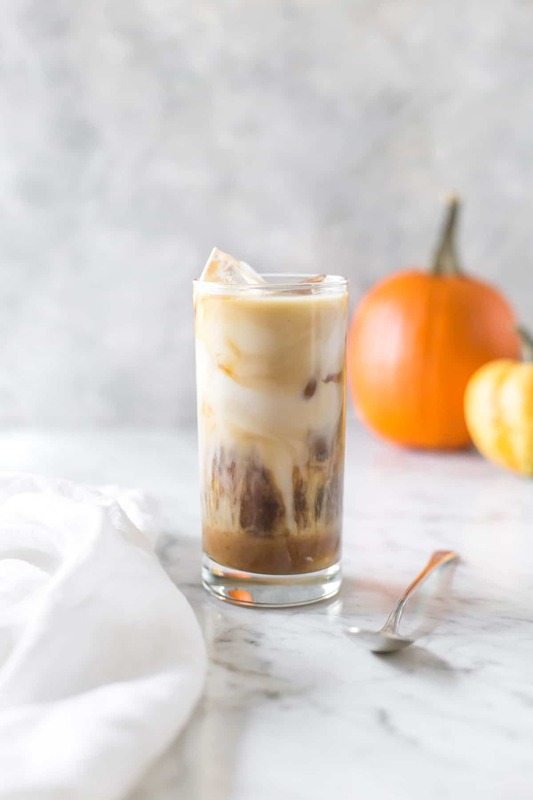 Alternatively, you can easily make a iced pumpkin spice latte by using cold milk and chilled espresso or cold brew coffee. 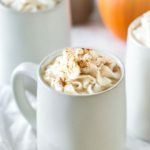 Make yourself a vegan pumpkin spice latte at home with this easy to make pumpkin spice sauce and your favorite coffee or espresso. In a large saucepan over medium heat, whisk the sauce ingredients together until smooth. Continue heating and whisking until sugar has completely dissolved. Remove from heat and store in an air-tight container, in the refrigerator, for until 2 weeks. Use about 1/4 sauce for each latte.